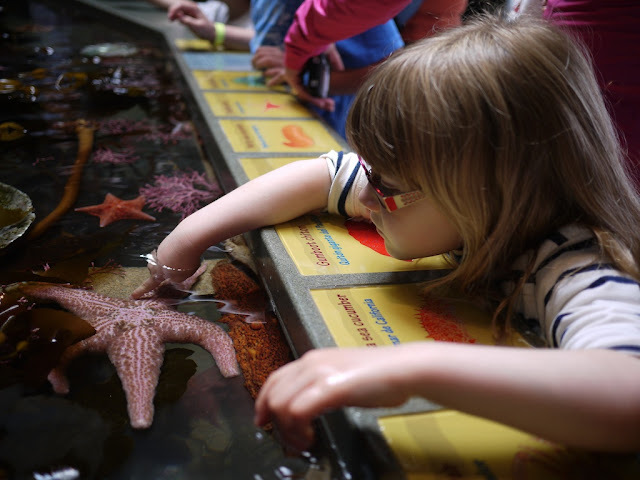 My list of places to take the kids in the Bay Area has some pretty cool destinations on it: farms, museums, playgrounds, galleries... There is one place on the list however that we anticipated visiting more than anywhere else; Monterey Bay Aquarium. 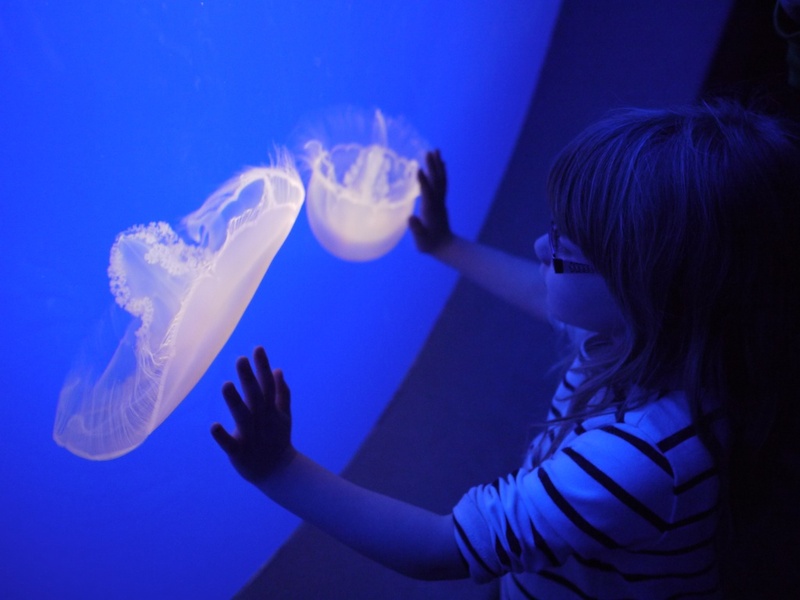 From a young age Ava has been enthralled by anything to do with life under the sea. 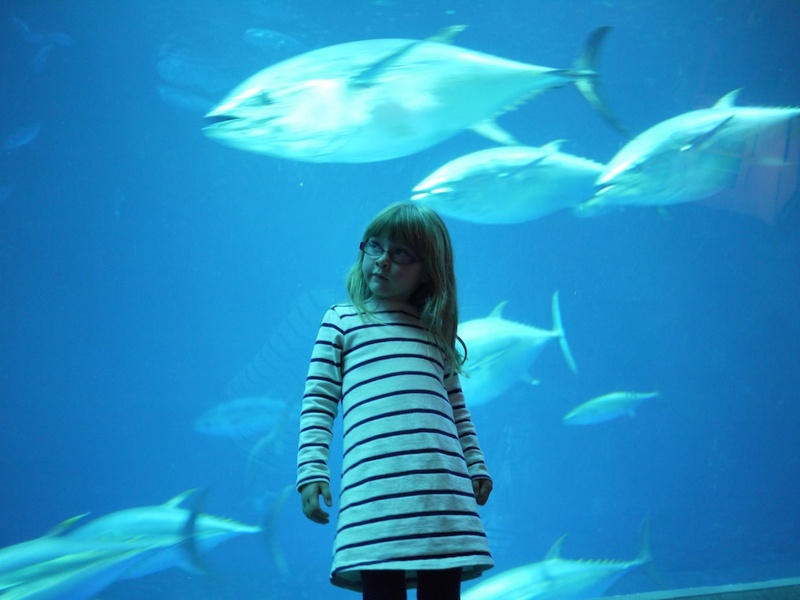 When she was two years old we visited Underwater World in Queensland and instantly she was hooked on anything and everything fishy. 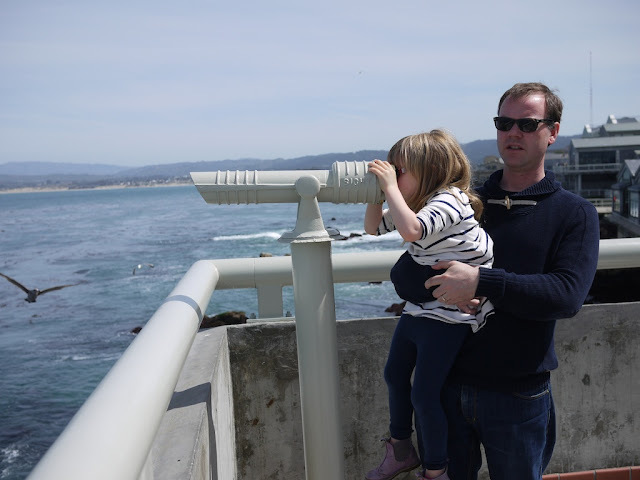 During Ava's recent Spring Break we took a trip down south to beautiful seaside Monterey. 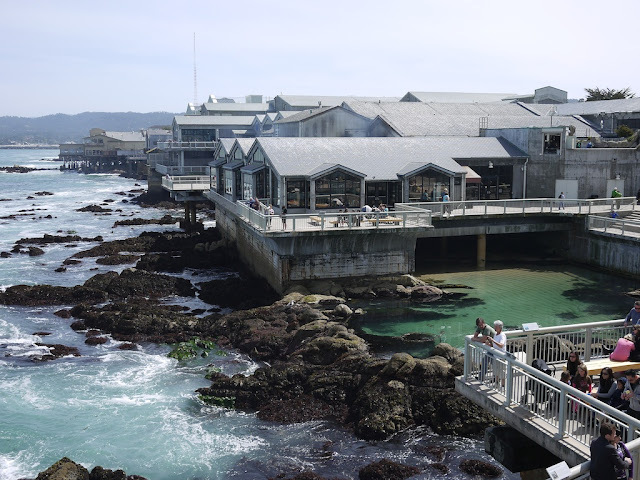 The big drawcard there being the Monterey Bay Aquarium. 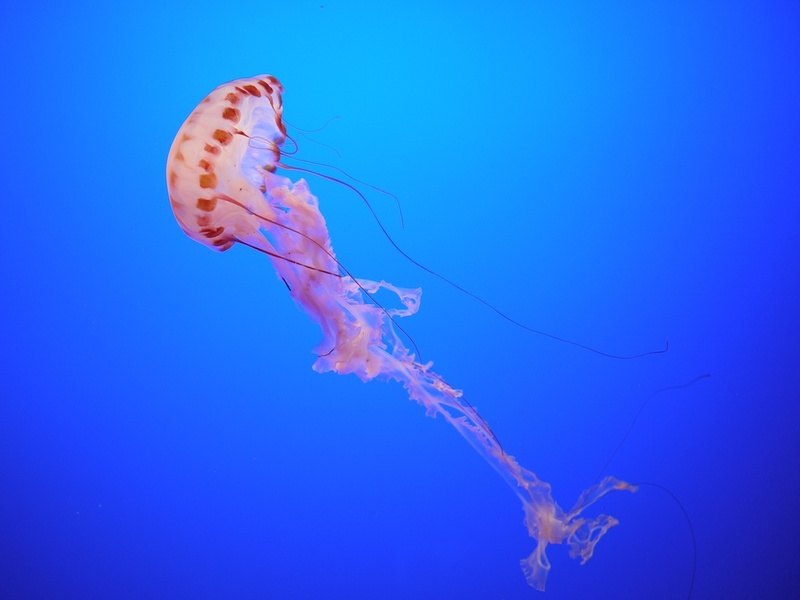 What an amazing place the Monterey Bay Aquarium is. Let's start by saying that it's HUGE. A full day here is barely enough. We spent a good part of a whole day here and while we saw everything we didn't have time to attend any of the animal feedings or watch the documentaries playing in the auditorium. 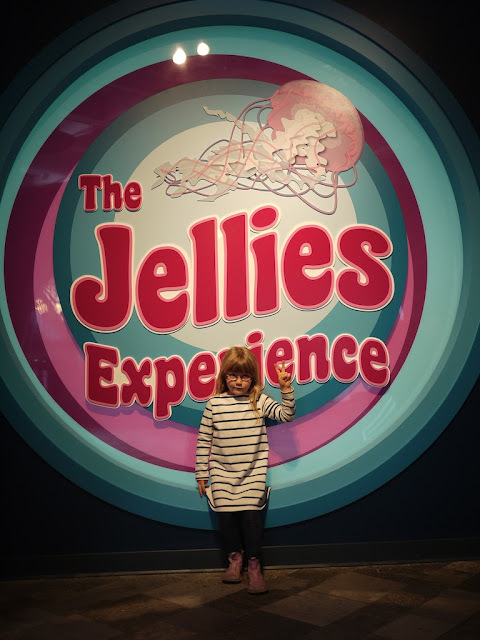 The whole place is pretty amazing but there were a few standout exhibits for me: The Jellies Experience, The Secret Lives of Seahorses, The Open Sea and The Wave Crash. 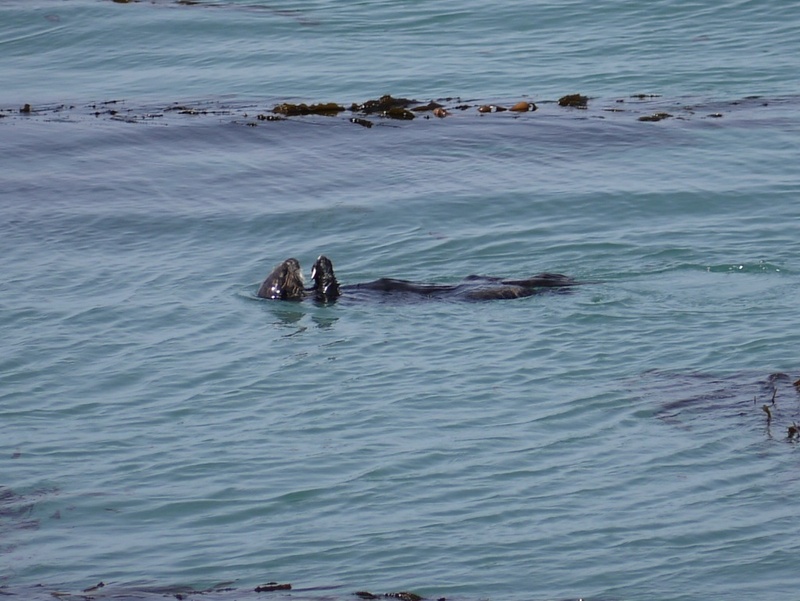 Spotting wild sea otters frolicking in the waves near the Aquarium was another highlight for me. I could have watched the furry little guys floating on their backs eating fish (or acorns as I heard one tourist suggest) for hours. Each time they took a dive under the waves we waited with bated breath for them to emerge again. And each time they emerged it was as exciting as spotting them the first time. 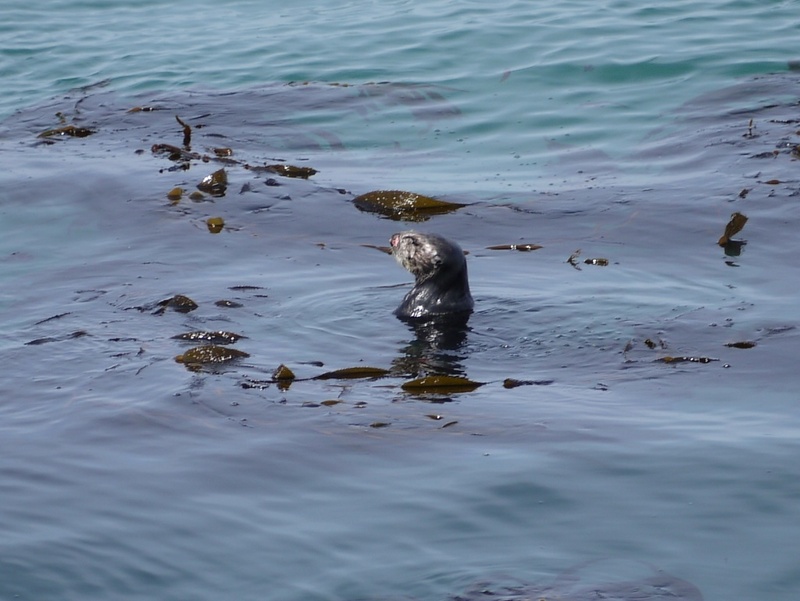 While there were sea otters to be seen in the aquarium there's just something special about seeing them in their natural habitat. Is that an acorn in his hands? 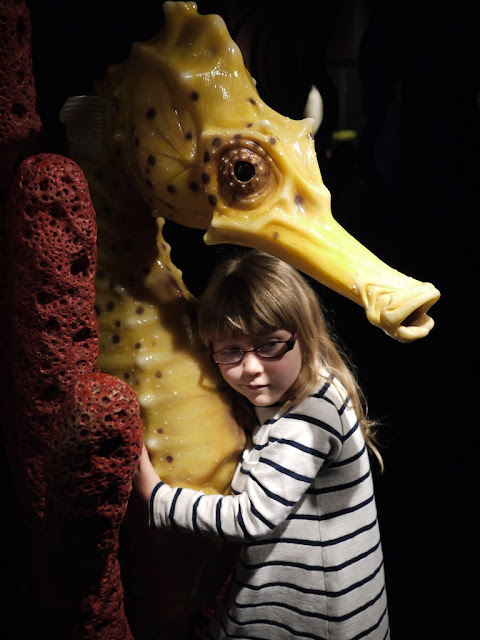 The Secret Lives of Seahorses exhibit was of particular interest to me. 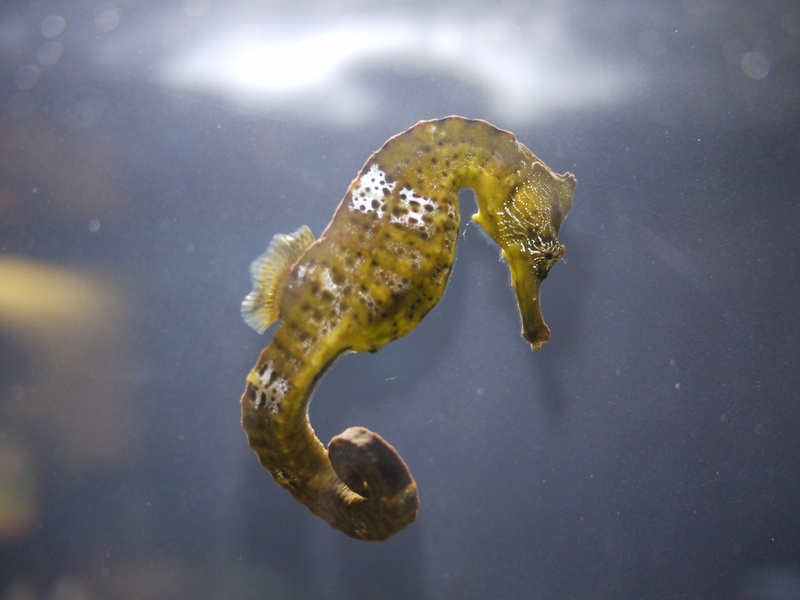 I have always loved seahorses but the elusive little creatures are not that easy to spot in the wild. 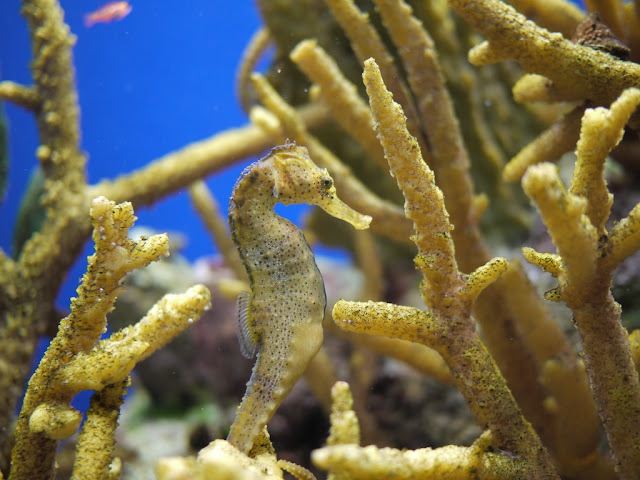 Here we were met with hundreds of little seahorses and their relatives. We watched as they bobbed along in their impossible looking upright manner or clung onto coral with their tails. 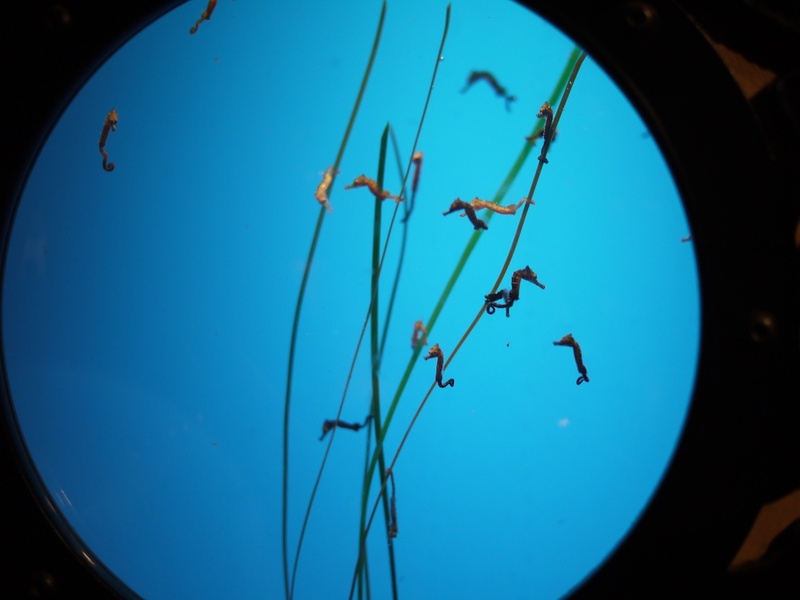 Tiny baby seahorses filled one tank and were delightful to see. Leafy sea dragons are another favourite of mine and there were plenty of these to see as well. 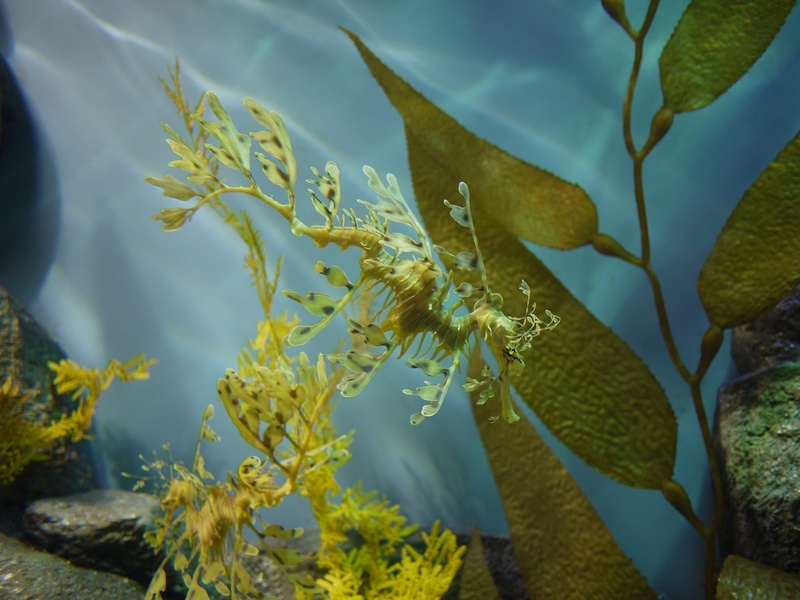 Although I find the leafy sea dragon a beautiful and graceful creature I was amazed at just how many children commented on how ugly or disgusting they were. Even Ava was not impressed by the leafy sea dragon. 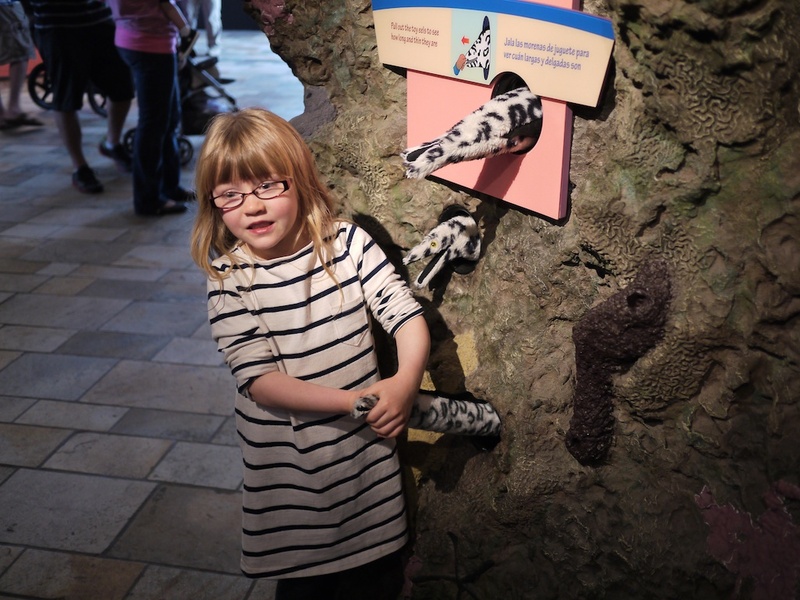 She was, however, very impressed with the seahorses and now desperately wants one as a pet! Teeny tiny baby Potbelly Seahorses - yet to grow their potbellies! The Jellies Experience was a psychedelic trip through the colourful world of the jellyfish. 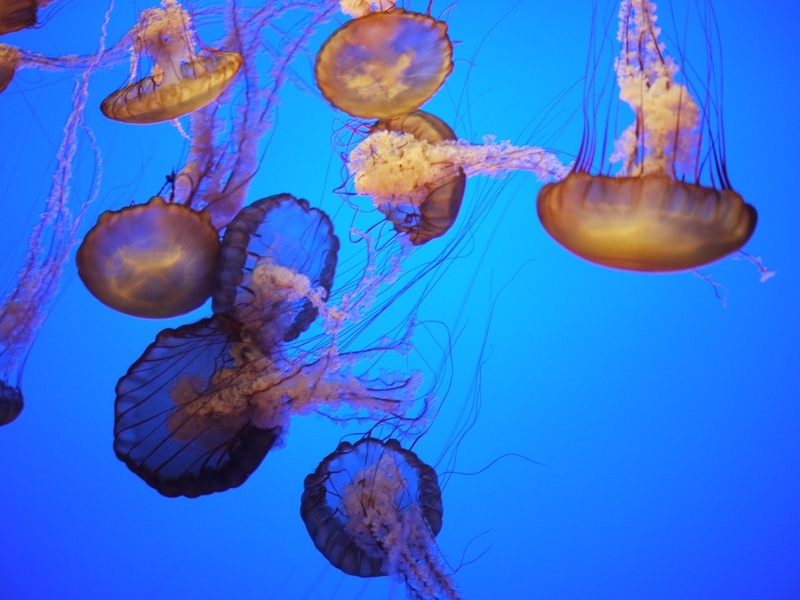 Myriad jellyfish species filled illuminated tanks and stunned us, not with their venomous tendrils but with their colour and graceful movement. 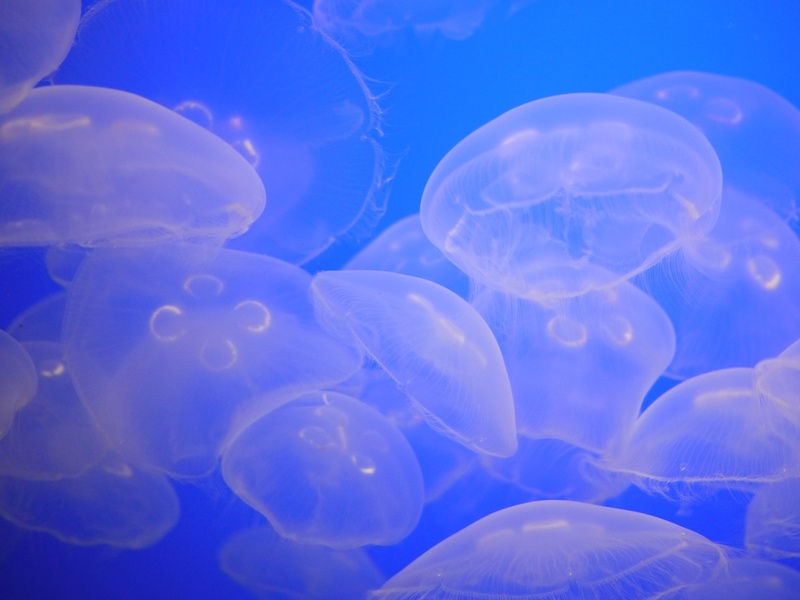 I could have watched the jellyfish bobbing about in their tanks for hours. 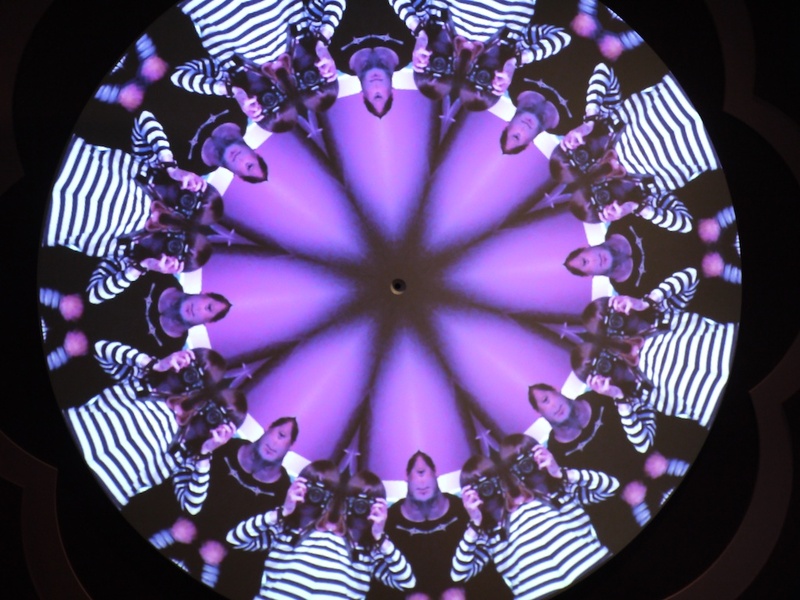 This exhibit had a decidedly sixties theme and, along with other hands on fun, featured a kaleidoscope projector which provided fun photo opportunities as you will see below. 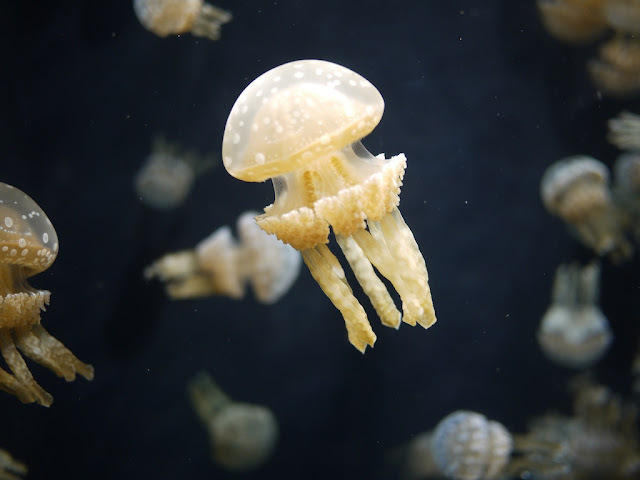 So graceful but I don't want to go near those tentacles! 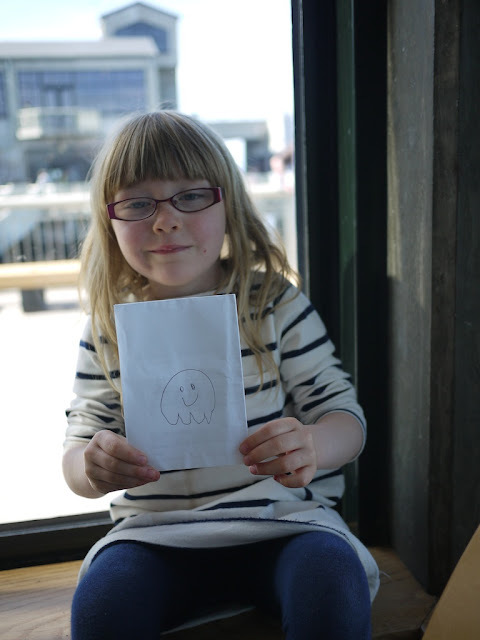 Here's Ava's jellyfish drawing. It looks just like the real thing - right down to the smiley face! 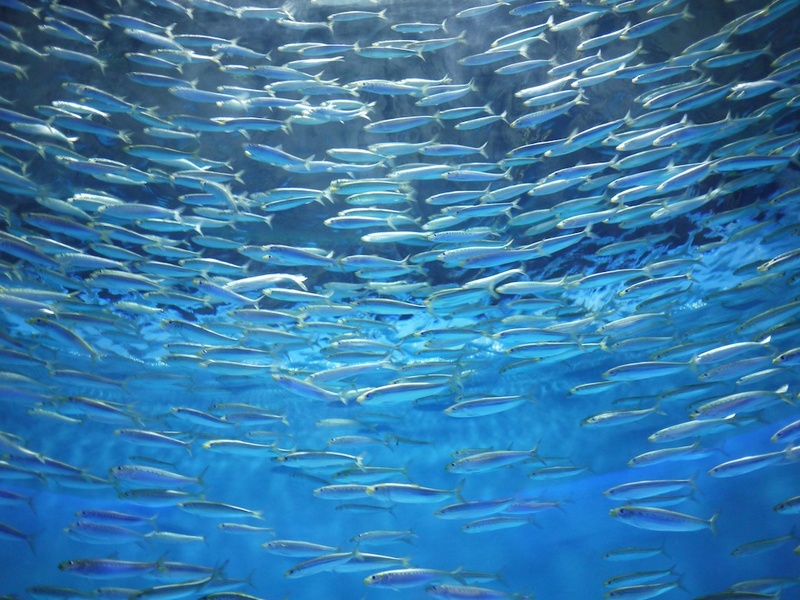 Watching schools of sardines swim overhead in the entrance to the Open Sea exhibit was absolutely amazing. 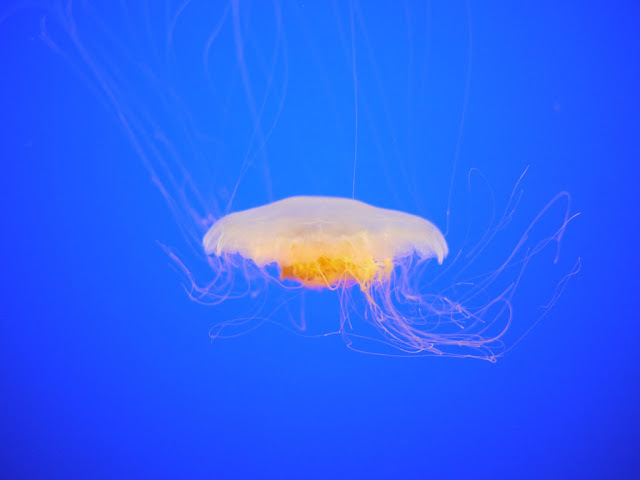 With the round room bathed in blue light it was a tranquil experience. This may also have had something to do with the fact that an over tired Lola had finally given up screaming and drifted off into a deep slumber! Ah, peace... 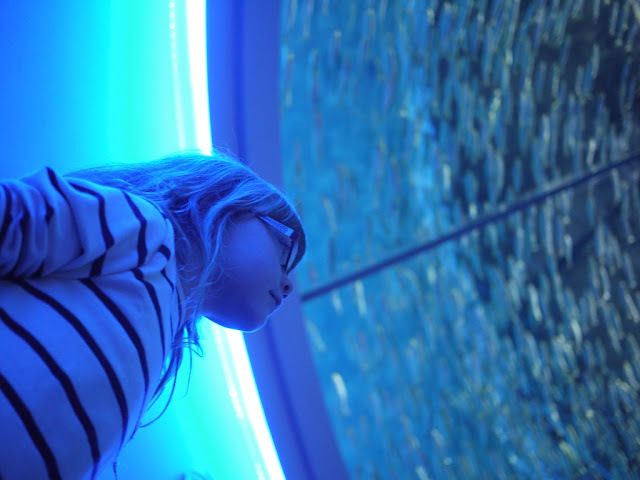 In the main room of the Open Sea exhibit we were met with tuna and hammerhead sharks among other fish in a floor to ceiling tank, once again bathed in blue light. 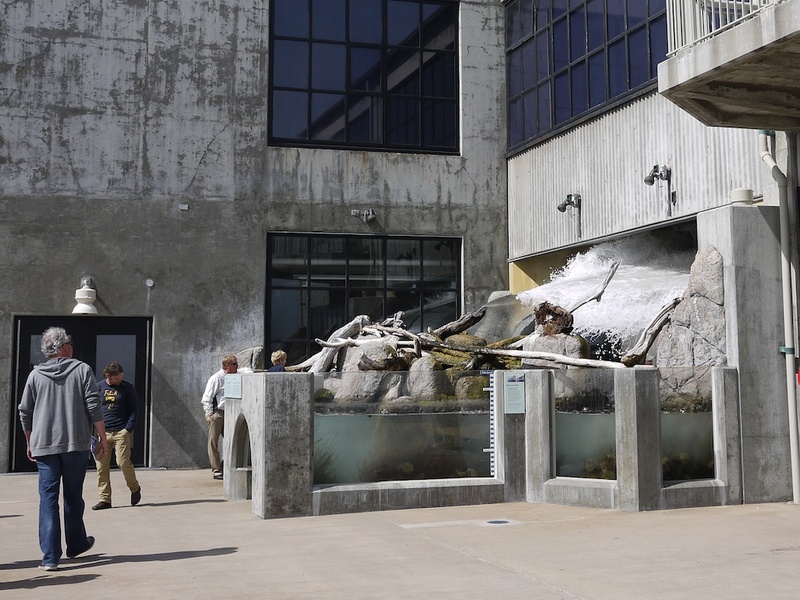 The Giant Kelp Forest exhibit lives up to its name and spans over three floors of the Aquarium building. 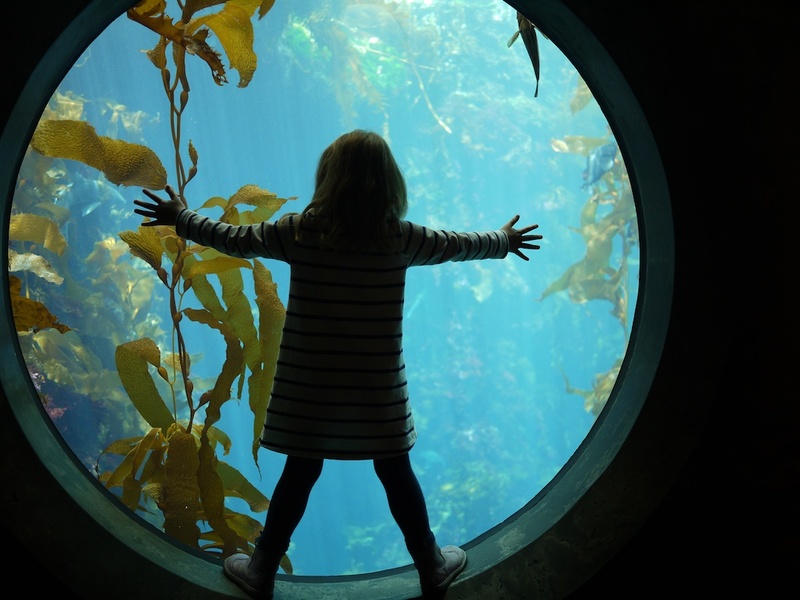 This exhibit mirrors the giant kelp forests growing just outside the Aquarium. Over the three floors visitors can view the various sea creatures that inhabit different parts of the kelp forest. The Wave Crash is part of the Rocky Shore exhibit and, as the name suggest, features a crashing wave. Visitors can experience the Wave Crash in two ways: viewing it from underneath in a walk through gallery or viewing it from outside on the deck. Both views of the crashing wave are pretty amazing but the prize has to go to the walk through gallery. Seeing the water crashing over the top of you without feeling a drop of it is certainly a strange feeling. 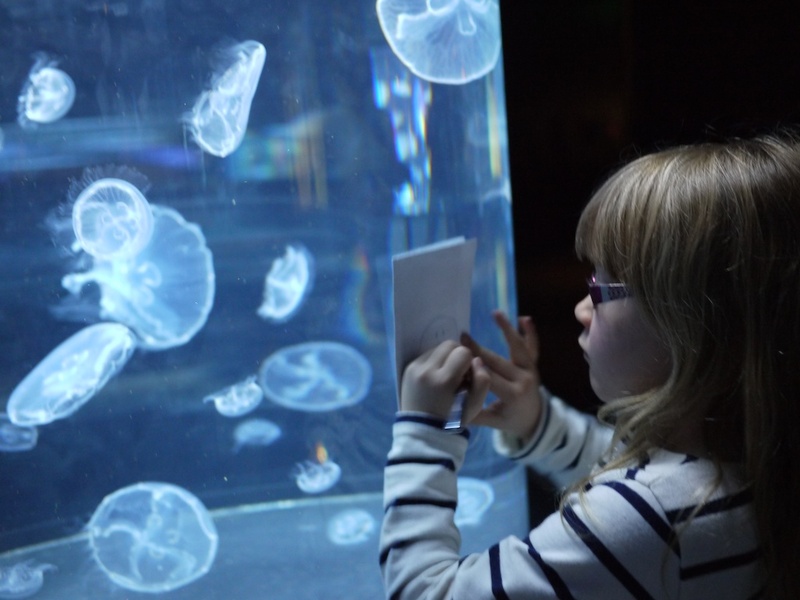 As per our visits to the aquarium at California Academy of Sciences, Ava and Lola loved having the chance to get up close and touch starfish, sea cucumbers, sea urchins and shells in the touch pools in the Splash Zone. 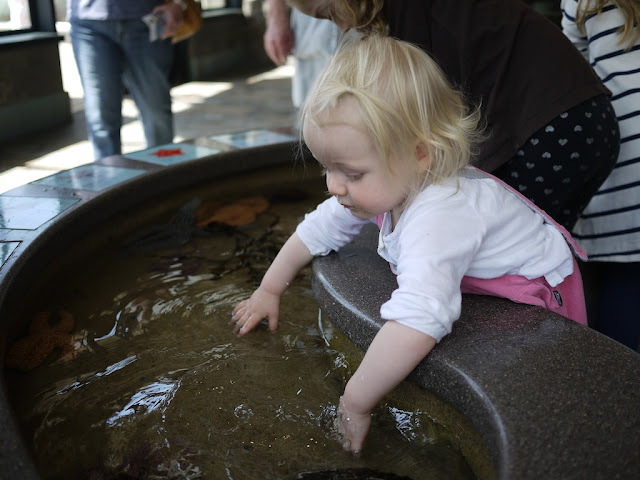 After past experiences with Lola drinking the water in touch pools I was extra vigilant in keeping an eye on her little hands. No sucking starfish tainted water off them this time! I found the sea cucumbers the most interesting creatures in the touch pools. After the rough texture of the starfish touching the sea cucumbers was a strange experience - so unexpectedly soft and very squishy. 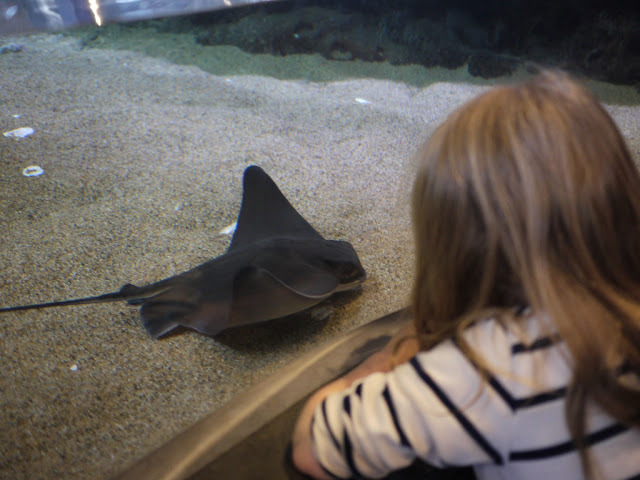 One low touch pool was inhabited by a friendly bat ray that visitors could touch. This particular pool was a little deeper than it looked and Ava's little arm could not quite reach in deep enough to touch the ray. Truth be told I think she was more than a little happy that she couldn't actually reach it. She was a little worried that it would sting her! Nearby in another shallow pool a few more bat rays were off limits to hands but could be viewed up close as they "flew" through the shallow water. Along with the touch pools there were lots of other hands on activities to keep the kids occupied. There were buttons to press and knobs to turn around almost every corner. 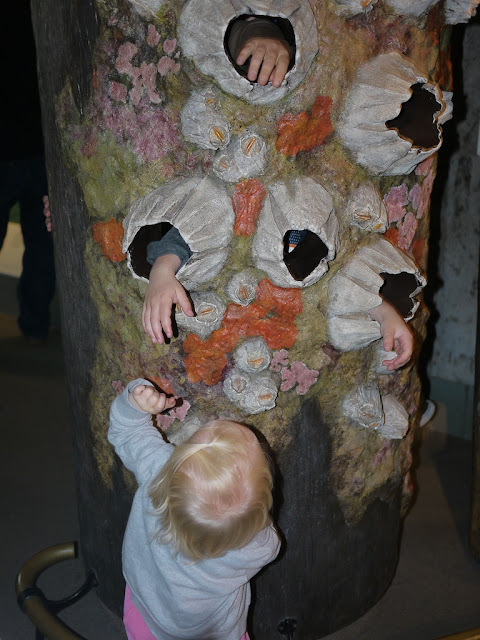 A fake jetty pylon featured holes in which kids could put their hands though and pretend to be anemones clinging to the sides. 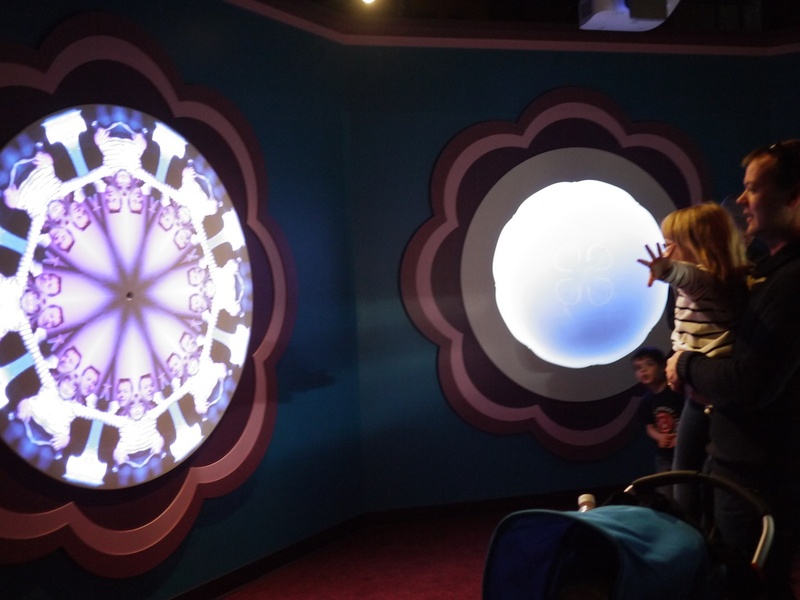 This provided lots of fun for the kids and it's amazing just how many adults freaked out when they saw the "hand anemones" move! 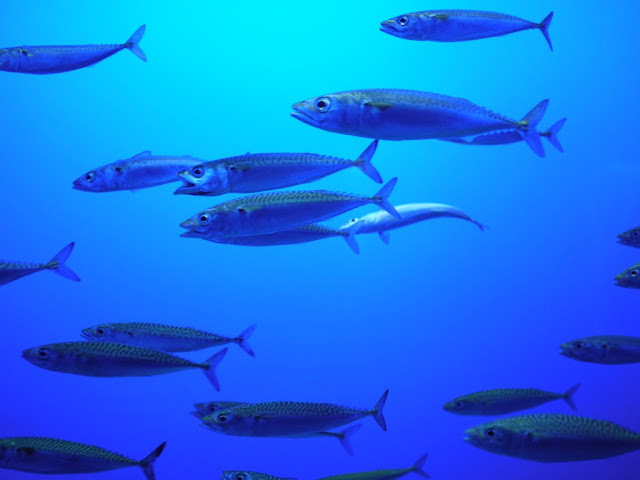 Another similar set up featured fake eels that could be pushed or pulled out of a fake rock. Ava loved pulling these eels out to scare Lola. Hand anemones grab at Lola! A gated play area for babies and toddlers provides the littlest visitors with a place to splash their hands in water, bounce on a water filled cushion and just stretch their little legs without toddling into the crowds outside. 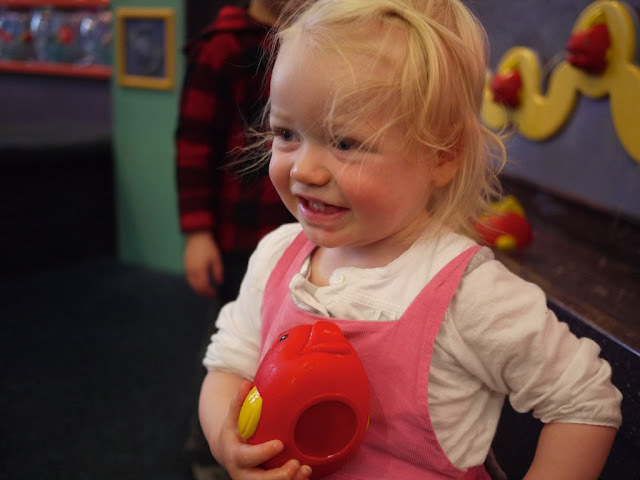 After waking up from her (thankfully) long nap, Lola was delighted to play with rubber duckies and plastic fish while getting her hands wet. 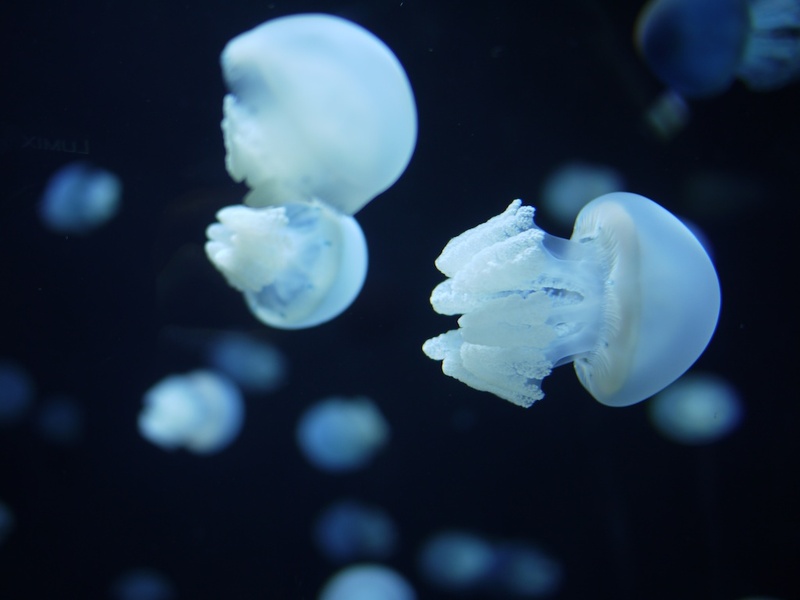 Close by a play area for slightly older children features play equipment for climbing, sliding and bouncing plus costumes for dressing up as your favourite sea creatures. 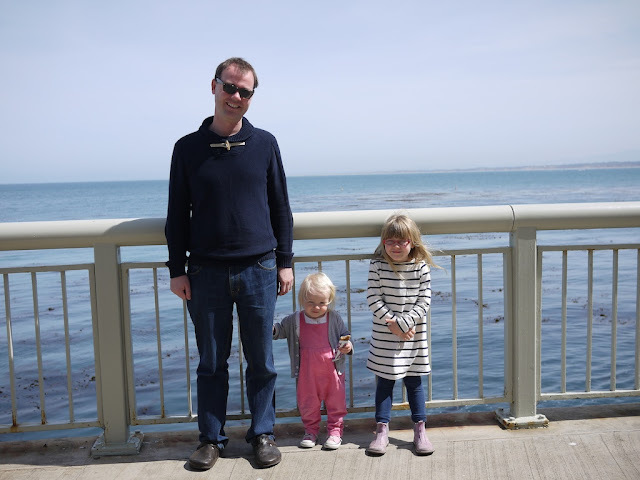 We had a wonderful time at the Monterey Bay Aquarium and highly recommend it to anyone visiting the greater Bay Area. When the girls are a little older we'll have to take them again and treat them to one of the many add on experiences available such as a behind the scenes or fish feeding tour, diving or maybe even a sleepover. 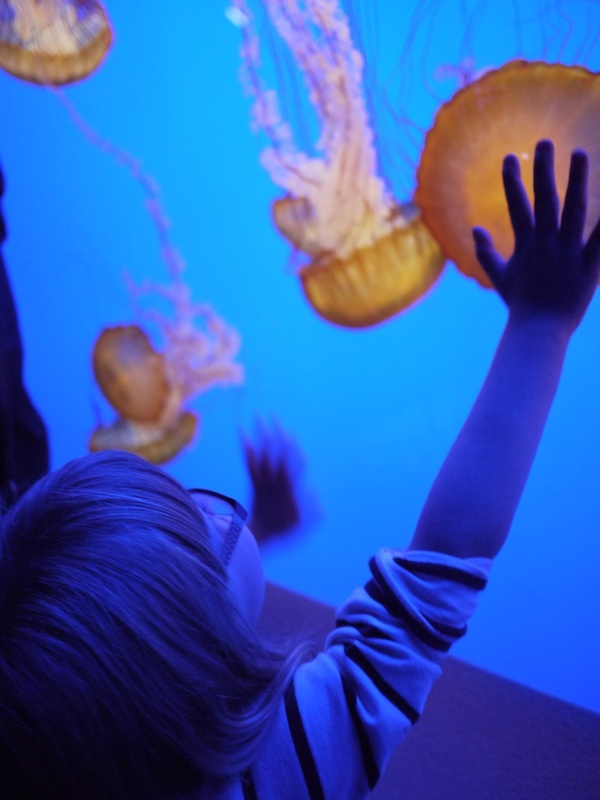 Until then we have our fond memories of our day at the aquarium.